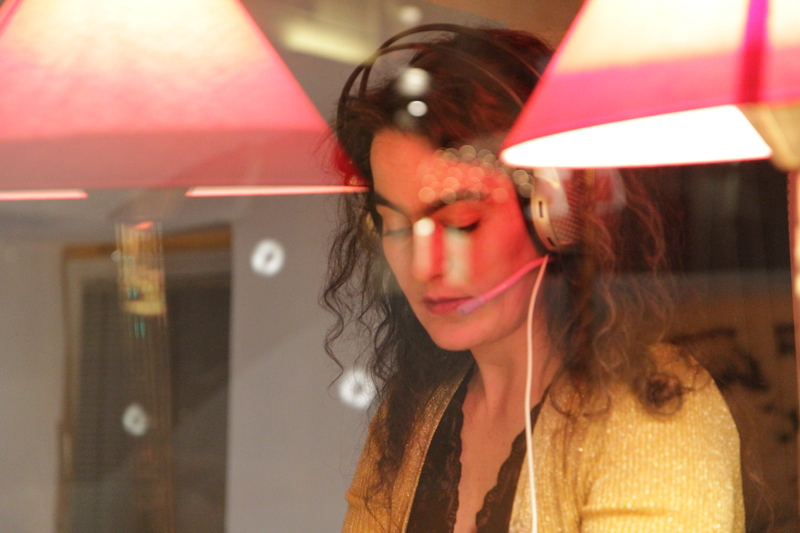 Born in Mexico City in 1972, Castelló studied music in her native town at the Conservatorio Nacional de México, at the Université de Montréal, at the Conservatorium van Amsterdam, at the Konservatorium der Stadt Wien and at the Department of Composition and Electroacoustics at the University of Music and Performing Arts Vienna. Since 1999, she has lived in Vienna, where she is a teacher. In the year 2004, she founded the concert series “Neue Musik in St. Ruprecht”, which she organizes to this day. Even though she remains devoted to old music, new and electroacoustic music take center stage in her work. She co-founded the ensembles Low Frequency Orchestra, frufru (with Maja Osojnik), cilantro (with Billy Roisz), subshrubs (with Katharina Klement, Tamara Wilhelm and Maja Osojnik) and Chesterfield (with Burkhard Stangl) Plenum, Zimt (with Gunter Schneider, Barbara Romen and Burkhard Stangl) a.o.. She has performed in Europe and America with these ensembles and with other musicians such as Olga Neuwirth, Wolfgang Mitterer, Martin Siewert, John Butcher, Dafne Vicente-Sandoval, Urkuma, Franz Hautzinger, Isabelle Duthoit, dieb13, Jerome Noetinger, Mario de Vega, Attila Faraveli, Kazu Uchihashi, Bonnie Jones, Juanjose Rivas, Steve Bates and others. As a composer, she writes for her own instruments (mainly the Paetzold sub great bass recorder, with and without electronics) and for ensembles (amongst them the Danubia Saxophonquartett, Reconsil Ensemble Vienna and the Haydn Piano Trio). Her music has been published by the labels Mosz, einklang_records, Mandorla Label, Mikroton Recordings, Monotype Records and chmafu nocords. Numerous composers, including Hilda Paredes, Daniel de la Cuesta, Katharina Klement, Burkhard Stangl, Jorge Sánchez-Chiong, and Mario Lavista, have worked with Angélica Castelló or dedicated pieces to her. In recent years, Castelló’s work has included installations that operate at the interface of music, performance and visual arts (Electroaltar, Electroaltar for J.C., Electroaltar für C.N., Margarita´s Stillleben Theater). Her debut album, “Bestario”, unites the multifaceted nature of Angélica Castelló’s work: Recordings of her own instruments serve as the raw material for pieces in which she edits the sounds of her flutes, sometimes beyond recognition, and combines them with frequently deformed fragments of other elements — be they electronically produced or found elsewhere — to a musical entity in which multiple layers overlap. She weaves existing pieces of other composers, such as Bach, into these contemporary forms of electronic processing, thereby referencing her work as an interpreter of old music. Even though her other sources of inspiration, such as from literature or visual arts, often have specific roots, they lead Castelló to an abstract engagement with such topics as death, and dealing with traumatic encounters. Wide-ranging combinations of sounds that are constantly and sometimes simultaneously moving in different directions provide continuity as well as surprises, and when listened to repeatedly, they shed new light on the beasts from literature, the animal kingdom, and daily life that have been set to music. Klangspuren Schwaz Festival, Salzburger Osterfestspiele (Salzburg Easter Festival), musikprotokoll im steirischen herbst (musikprotokoll in the styrian autumn), festival “music unlimited” wels, Ulrichsberger Kaleidophon, festivals Kontraste and Imago Dei (Krems), Osterfestival Tirol, LMC festival (London), taktlos-bern festival (Bern), Grabenfesttage (Vienna), Numusic (Norway), Interpenetration (Graz), Radar (Mexico), Konfrontationen (Nickelsdorf), Visiones Sonoras (Mexico), High Zero (Baltimore), blurred edges (Hamburg) and others; artist in residence in Schrattenberg (Austria) and Topolo (Italy). Currently, Angélica Castelló is working on a piece commissioned by the ensemble reconsil with a premiere in March 2015 in Vienna and on a piece for the duo Alcántara/Terrazas, which will premiered 2015 in Mexico City.